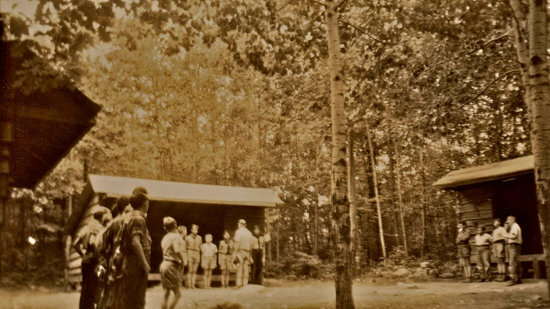 Camp Workcoeman’s new dining hall proved to be a valuable addition during the summer of 1938, hosting many a campfire. More than half of the camp season was rainy, and the downpours were so fierce that the camp road washed away. There was so much precipitation towards the end of the second week, and more predicted for week three, that many Scouts moved their reservations to week four. To compensate, the Northern Litchfield County Council offered a special week three discount, in which Scouts could attend for the rest of the third week at a dollar a day. In spite of the rain, overall camp attendance was up. The Scouts let it rain and carried on in the dining hall, filling the big room with the spirit of fifty boys. The new, larger dining hall could seat around one hundred and twenty people, and the size of the building reflected the farsightedness of the council volunteers. The Scouters of the Northern Litchfield County Council expected that camp attendance would slowly grow to fill the hall. To prepare for a larger future, in 1938 the Camping Committee divided the tenting area into three individual campsites, which they called villages. Perhaps coming close to what Frank Coe meant by a permanent camp, the council built three Adirondack Shelters in one site, with the intention of replacing all of the tents with shelters as the canvas wore out. These new shelters served as an incentive; the shelters were only open to Scouts who registered early. As another enticement, a Scout who signed up for the sparsely attended week one could arrive at camp two days early, a nine day program at a seven day price. As a final incentive, the Camping Committee offered a one-dollar discount for early registrations. When a full camp of fifty boys arrived on the eighth of July, they named the Adirondack village Rocky Ledge. The Scouts picked Poplar Grove and Camp Wasuwanee for the other two sites. The three camp villages allowed the staff to play up the competitive angle, not only in sports, such as soccer, volleyball, and softball, but also in Scouting skills. The staff also offered several season long contests for individual Scouts; the horseshoe championship was probably the most contested, but the fire by friction competition was an especially difficult contest. Clarence Rosenbeck did not return for the 1938 season, as he entered full-time employment. Therefore, the Camping Committee and Council Executive Palmer Liddle recruited Carl Bergquist as Assistant Camp Director and W. Whitney Tileston as the first formal Program Director. In addition to his summer camp experience, Bergquist directed the physical education programs for the public schools in Webster, Massachusetts. Tileston served as Music Director for Litchfield High School and the town’s grammar schools. Camp veteran Raymond French was promoted to Aquatics Director, after ten days of training at Camp Brooklyn. Like his predecessors, French emphasized swimming instruction, and the overall camp program was similar to past years. Perhaps thanks to Tileston, there was a greater emphasis on the campfire programs, especially the closing campfire on Saturday evenings. However, with many visitors in attendance at the Thursday campfire, Scouts tended to think of the earlier one as the major campfire. Wednesday evenings saw one new addition to the camp program, a film screening. Scouts watched a variety of movies ranging from The Complete Life of the Bee and the Making of Honey, to films from John Houlihan’s vacation in South America. However, on the last Wednesday of the summer, Flieg and Newbury, Incorporated, offered the boys a special treat, a Laurel and Hardy short, along with cartoons of Popeye and Mickey Mouse. The image below shows the Rocky Ledge Campsite in the late 1930s. Rocky Ledge occupied the present site of the Scoutmasters' Cabin, while Poplar Grove was immediately to the north-east of the current Nature Lodge.